LOVE's Haven: Got an Award! 1. Thank the blogger who awarded it to you. 3. 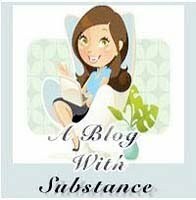 Pass it on to 10 other blogs which you feel have real substance. I am passing this awards to the following blogs that have inspired me and encouraged me to continue to learn and to grow not just in the world of blogging but to life itself. Be the only One, the Super One!